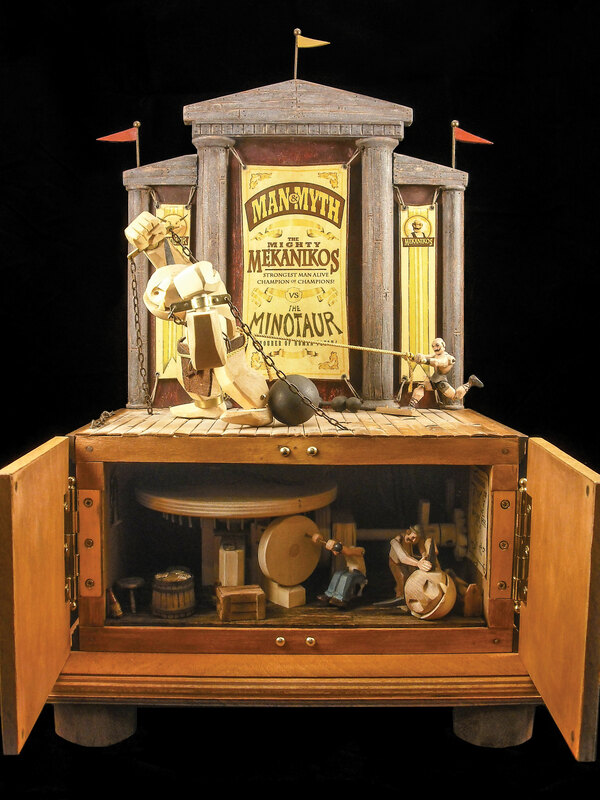 Mekanikos vs. the Minotaur is an elaborate mechanical machine. Dug North’s artist statement begins, “We have become distanced from the things that surround us.” He goes on to discuss the present state of people in industrialized nations, who own many pieces of mass-produced technology but do not understand how these objects work and have nothing to do with their creation. In his own work, Dug aspires to use simple non-synthetic materials to create pieces without wiring or circuitry, built to last for generations, existing for no purpose besides providing amusement and wonder. Dug’s wooden automata are meant in part to be objects with which people can have a much more familiar relationship: their mechanisms are visible and operate by the turn of a crank, allowing the person interacting with the piece to both activate and understand its workings. Devoid of the frustrations and bugs that often accompany contemporary devices, Dug’s work is just as captivating as those objects. Perhaps somewhat ironically, it is the modern innovation of the Internet which has enabled automaton-makers from around the world to connect with one another and form an international community. 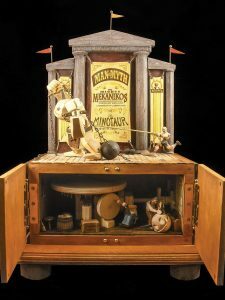 Dug’s interest in automata was born around 2002 after he stumbled upon the website of the Cabaret Mechanical Theatre, a group of automata artists largely based in the United Kingdom. Drawn by the intrigue and cleverness of the automata he saw, and by the combination of technical and artistic elements involved in creating automata, Dug decided to begin making his own in spite of having little previous experience with woodworking. The artists who have influenced Dug hail from a number of different countries: Paul Spooner, of the UK; Pablo Lavezzari, of Argentina; Pierre Mayer, of France; and Thomas Kuntz, of the United States. Although Dug’s automata are built to refresh their technology-saturated viewers, certain technologies have served to bring together automata creators from all corners of the globe. 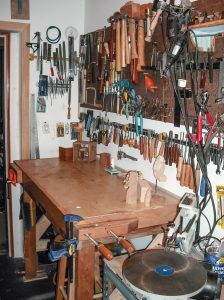 A view of his workshop, showing the variety of tools Dug uses on his automata. One of Dug’s primary focuses is the storytelling aspect of automata, which is made complicated by the limited number of elements able to communicate to the viewer—similar to one-panel cartoons. Dug uses the appearance and motion of the figures in his pieces, as well as the titles of the pieces, to tell the story which is taking place within their little wooden worlds. A favorite theme for Dug is magic tricks, and he has created two pieces featuring an automaton magician performing a trick. Dug’s ideas sometimes start with characters which inspire the story of a piece; other times, Dug decides to build a scene around a particular mechanism he wants to use. In one instance, Dug work up in the middle of the night with an idea already fully formed. He has also been commissioned to build automatons based on customers’ ideas. It can take anywhere from a week to several years for Dug to complete an automaton, depending on the complexity of the piece. Dug’s process begins with sketching out his ideas. 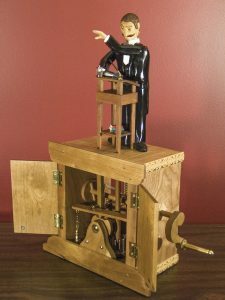 To begin experimenting with the mechanisms for the automaton, he mocks up certain elements of the piece in materials like cardboard, popsicle sticks, and rubber bands. 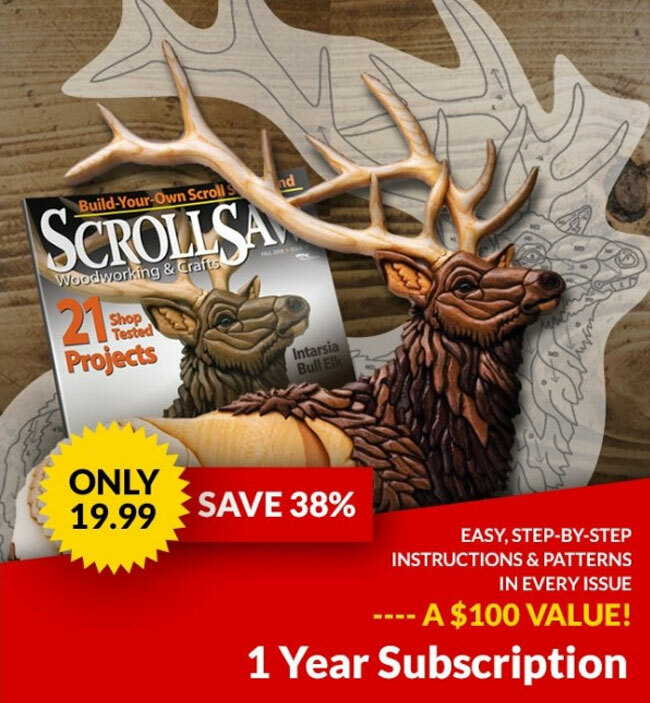 Using the insights gained from these rough models, he constructs a prototype from scrap wood, continuing to work out the design as he builds. The final piece is then created with much care and attention to detail, using mostly miniature tools to attain the intricacy and small scale of his work. 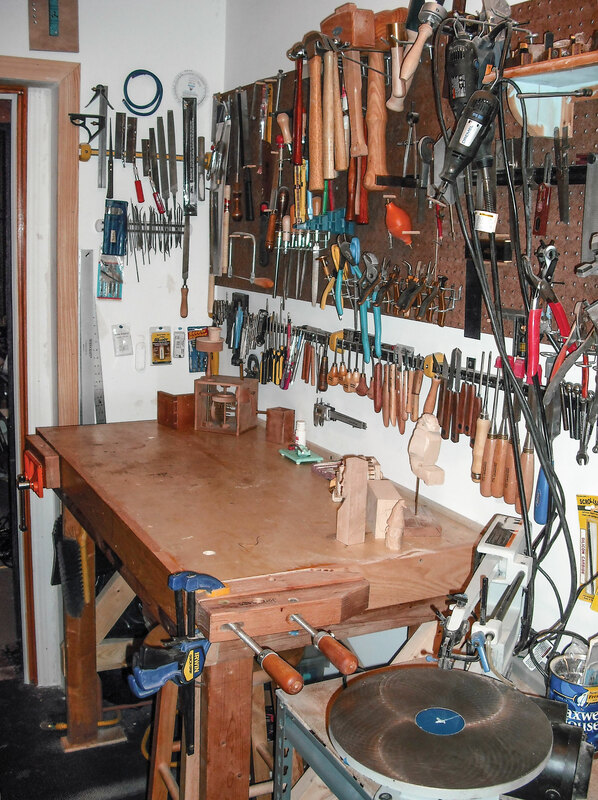 Dug uses a variety of woods for his automata, including basswood, birch, cherry, and other assorted hardwoods. For delicate mechanisms like those Dug makes, the choice of wood is vital; he is careful to use woods which are fairly stable and not subject to significant change in response to temperature and humidity. Machini the Magician performs a levitation act. Upon viewing Dug’s finished product, most people find themselves fixated on the charismatic figures or on the wooden mechanism that powers them. 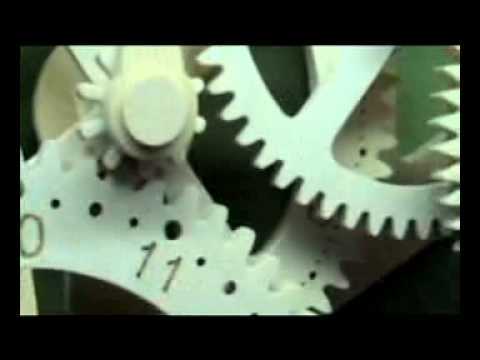 Dug’s work elicits wonder and delight—and, often, suggestions for other possible automata. 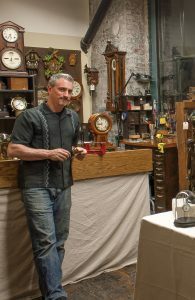 Some of his creations now reside in private automata collections, and he received three Editor’s Choice Awards at the 2012 World Maker Faire. 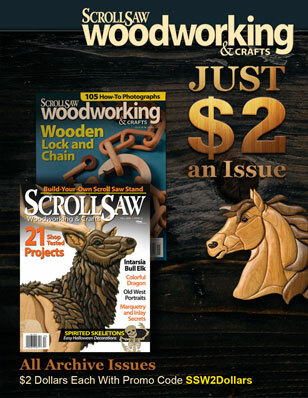 Dedicated to encouraging new automata-makers and enriching the art itself, Dug has written how-to articles for magazines and shares his knowledge and experience in a regular column on automata techniques for the Cabaret Mechanical Theater. Although the modern age is awash with touch screens and gadgets, Dug and his fellow automata-makers continue to demonstrate that an object need not run on batteries to fascinate its audience. For more, visit Dug’s website at dugnorth.com, the Cabaret Mechanical Theatre at cabaret.co.uk/, or Dug’s Automata/Automaton group on Facebook.